A new season of RVing is upon us. 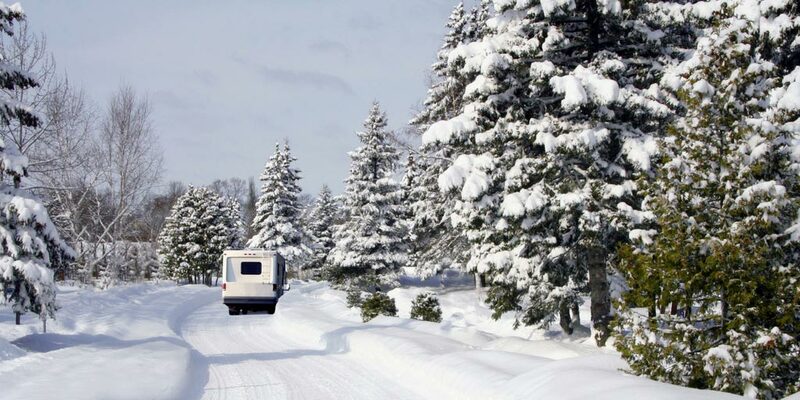 Winter is truly a magical time of year ‘ not just because of jolly little elves spreading holiday cheer ‘ but also that wonderful white dusting of snow and ice that ushers in a wide array of winter activities for RVers. Winter Wonder Wildhood, if you will. For a little snow-capped travel inspiration, check out our roundup of eight awesome winter activities for the great outdoors! Stompin’ Tom Connors said it best: ‘the good ol’ hockey game is the best game you can name.’ Bring your skates, hockey sticks and a couple of pucks along for the ride and play a pick-up game of hockey at your next RV pit stop. If you didn’t bring a net with you, no worries ‘ just grab a couple of water-filled jugs from the cooler to stand-in as goalposts. If you aren’t parked at a proper ice rink and are looking to play hockey on a pond or creek instead, make sure that the ice is solid enough and safe to skate on. Get ready to channel your inner ‘Great One’ in the great outdoors! For some of us, hockey is more of a spectator sport, but we can still enjoy a leisurely spin on the ice. Bundle up and bring your along your skates (and also a thermos of hot cocoa!) for a fun daytime activity with the family. Some cities and parks even have outdoor skating ponds with cozy bonfires. Do a little research before you head out on your RV trip to plan out your pit stops and find a safe spot for an afternoon skate. Fishing enthusiasts and newbies alike flock to Canada to experience one of our nation’s most historic and cultural winter traditions. There’s something really special about setting out on an ice fishing trip with your buddies and finding some fresh catch for dinner. What a fantastic way to #BringBackWildhood! Not sure about where to go or how to get started’ Keep in mind that provincial rules and regulations around fishing (including ice fishing) vary from province to province, territory to territory. Do your homework in advance and find out what you need to know about fishing licenses/permits and ice safety for the region. Several provincial tourism boards offer a wealth of online resources for ice fishing trips and tours ‘ here are some helpful links for Alberta and Ontario. For a low-impact workout and fresh breath of air at rest stops or at your destination, grab your snowshoes and go for a nature walk in the snow. Check out the Parks Canada website for ideas on great places for snowshoeing in national parks, as well as news and updates on trail safety and closures. Curious about trying snowshoeing, but don’t have any gear’ Snowshoes (and poles) are available for rent or purchase at affordable prices at most outdoor/sporting good stores. Just make sure you bundle up in layers and wear warm footwear to keep the snow away from your toes! World-class groomed trails await you! In fact, British Columbia has more than 50 cross-country skiing areas for skiers of all levels. Quebec is also known to be ‘blessed with lavish quantities of snow’ and is the perfect destination for cross-country skiing and winter enthusiasts. Do you enjoy the swoosh-swoosh and the adrenalin rush of skiing down the slopes of a mountain’ Are you more into the ‘pizza slices and french fries’ style of skiing’ Or, do you prefer carving through the snow with your snowboard instead’ Regardless of skiing or snowboarding level, there are plenty of options to take part in these winter sports across Canada. According to the Canadian Ski Council, there are an estimated 5 million skiers and snowboarders in Canada ‘ with more than 275 ski areas in Canada. Chances are, you’ll have several options for nearby venues and likely no problem finding a ski/snowboard buddy to tackle the slopes or take a lesson with you! What’s a more Canadian way to enjoy the fresh winter air than on a toboggan or dogsled ride’ If you haven’t tried either before, you’re in for a thrill of a lifetime. Taking the kiddos out tobogganing is a great family-friendly activity that is easy on the wallet. Bundle up and pack the toboggan from the garage (or pick one up at your local sporting good store). Consult with the local tourism office, or your local park ranger at provincial or national parks, to help you find a safe, open spot away from trees, debris or rocky cliffs. Safety first! For a little more adventure (and perhaps a little splurge), consider a dogsledding tour as a cool way to experience the frozen landscape of the Great White North. There are plenty of dogsledding tour options available across Canada ‘ check with your local tourism bureau for recommendations. ‘It’s wintertime and the weather’s fine. Did you know that you can get a sport-utility RV ‘ a Toy Hauler RV ‘ that allows you to bring your outdoor ‘toys’ (including snowmobiles) along for the ride without leaving behind the comforts of home’ Cargo space is ample, with sleeping/dining/lounging areas designed fold-up against the interior walls of the RV. There’s even a swing-down ramp for easy access and transport of your snowmobile in/out of your RV.